Viking Splash Tour in Dublin. Creative commons photo by Andrew Parnell. How are you going to make the most of your time and experience the real Dublin when you visit for TBEX? Here at Homestay.com our motto is ‘Don’t just visit, live it’, which is why we asked some of our Homestay.com hosts in Dublin to tell us how they would advise people to spend their free time during the TBEX conference. Our host families are the people with local knowledge which means that guests who book on Homestay.com get the chance to see beyond the usual tourist trail and quickly find their feet in a new place, whether it’s help with local orientation or places to eat. Here we list some tips and advice given to us by real ‘Dubliners’ featuring everything that a good blogger needs to enjoy their visit. This one always makes the list – visiting a Dublin pub is a must. However, they are not all found in Temple Bar! Try ‘Grogans Castle Lounge’ on Castle Street for a pint of Guinness and one of their famous toasted ham and cheese sandwiches. Established in 1972, Grogans became a favoured meeting place for cutting-edge Irish writers of the time. An establishment full of history and character. Think communicating with hashtags is cool? Visit the historic ‘Chester Beatty Library’ in Dublin Castle and view the precursors to hashtags – cairographics and sand scripts – which date from about 2700 BC to the present century. Enjoy a free guided tour and then relax in the Silk Road Café, one of Dublin’s best kept secrets, which overlooks the grounds of the castle. A tourist activity that Dubliners also love to do! 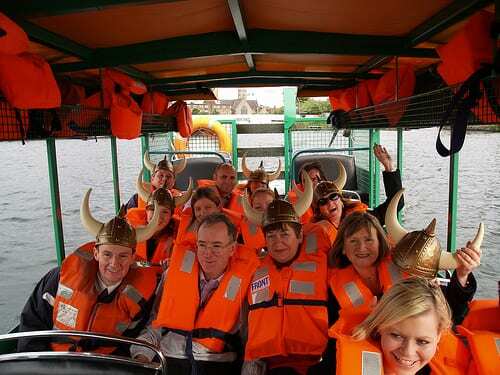 Hop aboard the ‘Viking Splash Tour’ and experience Dublin by land and water. Roar like a Viking at passers-by (yes really) and hold onto your Viking helmet for this fun way to see Dublin city. Ending in Grand Canal Dock – this tour will allow you to see where the Google and Facebook offices are based – you might even catch the employees having a party on their roof garden! Author Bio: Alan Clarke is CEO of Homestay.com, an Irish company that are building a cultural experience into the travel experience by having established a trusted global network and community of homestay hosts, each of whom welcome visitors to stay in their home. This offering is an affordable alternative to ordinary tourist accommodation and allows visitors to share a meal, learn customs, hear stories and enjoy traditions with the people that really make the place what it is. Homestay.com can also match visitor’s interests with their hosts to ensure that they have the best trip possible. Visit Homestay.com for more information.